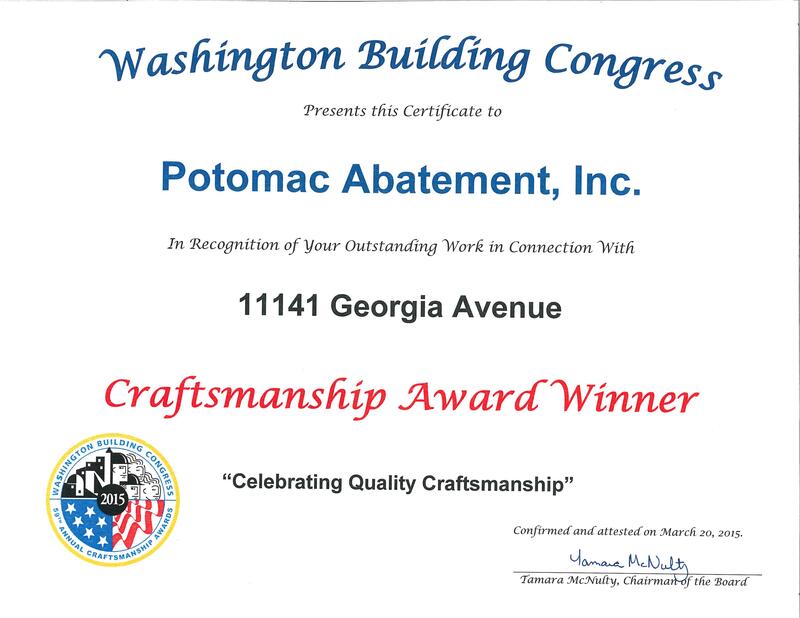 Craftsmanship Award that Potomac Abatement received from the Washington Building Congress for the outstanding work we performed at 11141 Georgia Avenue project. Interior demolition began with selective demolition for the abatement of asbestos containing materials, such as ceiling tiles, flooring glue, window caulk and a variety of other materials. Abatement took place with specialized equipment and experienced workers extensively trained in the processes. Because of the proximity to residential units at adjacent properties, all eyes were on Potomac Abatement. The MDE visited the site regularly to ensure the neighbors that all proper safety methods were being enforced. Once the abatement was complete, 7 levels of interior demolition took place within the office building. This included the demolition of the existing stairwells and elevators. None of the Penthouse MEP equipment was salvaged, and because of size and weight, it had to be cut into sections and craned off the roof. Once the elevators were removed, removing demolition debris became an issue as well. Again, because of the proximity to residential neighborhoods, Potomac Abatement could only use the trash chute during limited hours. Structural demolition started at the Penthouse. Once completely demolishing the penthouse roof, walls and topping slab, the existing columns were left at 4’ to tie into the new steel structure to be built above. The means and methods used were to work from the top down since the new openings in the 6 1⁄2” thick slab would be more safe if demolished to the floor directly below. When the basement level was reached, Potomac Abatement had the task of saw cutting part of the A7 footer and completely demolishing the B7 14’x14’x4’ footer to make room for new elevator pits. Potomac Abatement worked closely with our team and the concrete contractor to coordinate the structural demolition. Existing beams and columns could not be demolished until lower level concrete strengthening had been complete. As well, the façade demolition required a precise procedure as to maintain the structural integrity of the façade that was to remain. Large safety nets were installed at elevations where Potomac Abatement was working, in order to provide maximum safety to the open drive alley below. without Potomac Abatement’s involvement. They brought the true meaning of team work to life and delivered.